In October 2009, The Veteran’s Memorial marker was erected on the City Hall lawn. Visible from Highway 730, the marker is a large, somber monument to our veterans. The side facing the highway displays the flag of the United States of America with an inscription that reads “TO THOSE WHO FOUGHT FOR IT FREEDOM HAS A TASTE THAT THE PROTECTED WILL NEVER KNOW” and “TO ALL OF OUR COURAGEOUS VETERANS WE THANK YOU FOR YOUR SACRIFICES. On the base of the marker are the insignias of the five US Armed Services. The side of the marker that faces City Hall has the POW-MIA symbol with the inscriptions “WHERE THIS FLAG FLIES YOUR MEMORY RESIDES” and “YOU ARE NOT FORGOTTEN”. The marker is near the flagpole and the Irrigon War Dead memorial marker. 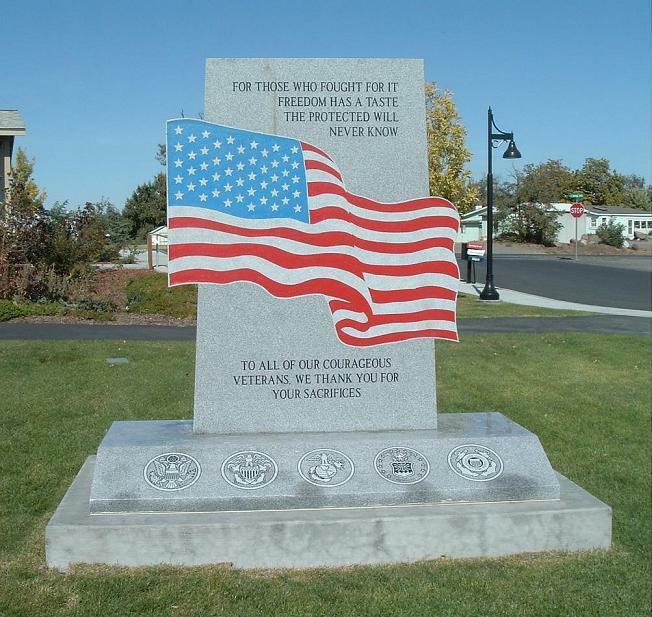 In March 2009, the City Council gave final approval for the design and citing of the Irrigon Veteran’s Memorial. The Veteran’s Memorial is a community sponsored project headed up by Roy and Sandy Henry. It has taken four years with an estimated cost of completion of $15,000. All money for the memorial was raised by the Veteran’s Memorial Committee. No City funds or tax revenue was used for the project. The memorial will be located near the existing memorial for Irrigon’s War Dead. A 70 foot semi-circle plaza will be built for the monuments and flagpole. The memorial site will be visible from Oregon State Highway 730, located on the highway side of the city hall building.